A US Army M1A1 Abrams Main Battle Tank, and personnel from A Company (CO), Task Force 1st Battalion, 35th Armored Regiment (1-35 Armor), 2nd Brigade Combat Team (BCT), 1st Armored Division (AD), patrol through Baghdad, Iraq, during Operation Iraqui Freedom. Photo: TSGT. John L. Houghton Jr., USAF, Nov 13, 2003. Courtesy US Army. The M1 Abrams Main Battle Tank is made by General Dynamics Land Systems Division of USA. The first M1 tank was produced in 1978, the first M1A1 in 1985 and the first M1A2 in 1986. Production of M1A1 tanks for the US Army is complete. Over 8,800 M1 and M1A1 tanks have been produced - 3,273 M1 tanks were produced for the US Army. 4,796 M1A1 tanks were built for the US Army and the US Marines, and 555 co-produced with Egypt. Egypt has ordered a further 200 M1A1 tanks with production to continue to 2005. 77 M1A2 tanks have been built for the US Army, 315 for Saudi Arabia and 218 for Kuwait. For the M1A2 Upgrade Program, over 600 M1 Abrams tanks are being upgraded to M1A2 configuration. Deliveries began in 1998. The US Army planned to procure a total of 1150 M1A2 SEP tanks but finally it was decided to cancel future production of the M1A2 SEP from FY2004, but in June 2005 ordered the upgrade of a further 60 M1A2 tanks to the SEP configuration. A further 60 were ordered in August 2006, and 180 in November 2006. Production of new M1A1 and M1A2 Abrams tanks is in its final phase for Foreign Military Sales. In March 2004, the Australian Army announced the purchase of 59 US Army M1A1 tanks to enter service from 2007. The contract was signed in November 2005 and the first five were handed over in February 2006 at GDLS in Lima, Ohio. The first 18 tanks were delivered to the Australian Army at the School of Armour in Victoria in September 2006. The remaining 41, to be based in Darwin, are scheduled to arrive in Australia in March 2007. In June 2006, Saudi Arabia requested the foreign military sale of 58 M1A1 tanks and the upgrade of these and the 315 M1A2 already in the Saudi inventory to M1A2S configuration. The upgrade involves rebuilding to a 'like new' condition, similar to the US Army Abrams Integrated Management Program (AIM). Three versions of the Abrams tank are currently in service the original M1 model, dating from the early 1980s, and two newer versions, designated M1A1 and M1A2. The M1A1 series, produced from 1985 through 1993, replaced the M1's 105mm main gun with a 120mm gun and incorporated numerous other enhancements, including an improved suspension, a new turret, increased armor protection, and a nuclear-chemical-biological protection system. The newer M1A2 series includes all of the M1A1 features plus a commander's independent thermal viewer, an independent commander's weapon station with second generation thermal imager; commander's display for digital colour terrain maps; second generation thermal imaging gunner's sight with increased range; driver's integrated display and thermal management system, position navigation equipment, and a digital data bus and radio interface unit providing a common picture among M1A2s on the battlefield. In February 2001, General Dynamics Land Systems was contracted to supply 240 M1A2 tanks with a system enhancement package (SEP) by 2004. The US Army planned to procure a total of 1150 M1A2 SEP tanks but decided to cancel future production of the M1A2 SEP from 2004. DRS Techologies has also been awarded a contract, the Firepower Enhancement Package (FEP), which consists on the upgrade of the US Marine Corps M1A1 tanks with second generation thermal imaging sights. The M1 Abrams Main Battle Tank - Brief Historic Data. The Chrysler prototype, which would be the winner of the US Army contract for the M1 Abrams production. Back in October 1973, one event would decisively influence the future of the new American main battle tank: the "Yom Kippur" war in the Middle East. This war involved the largest concentration of tanks in combat since World War 2. After careful investigation of the events occurred during this conflict, the US Army concluded that the emergence of a new order of weapon lethality was dramatically revealed in the Arab-Israeli War of 1973. Facing the nature of this threat, the new US doctrine set as its priority the defense of NATO Europe against a quantitatively superior Warsaw Pact forces of greatly increased lethality. It accepted force ratios as a primary determinant of battle outcomes and argued the virtues of armored warfare and the combined arms team. This notion of stronger inter-service integration would to be introduced as the "air-land battle" concept in 1976, and to result in the AirLand Battle Doctrine in 1982. The M1 Abrams tank represented a definitive change in US tank design since World War 2, and its design reflects the objective to be an adequate response to the main threat of that era - the overwhelming numerical superiority of the Warsaw Pact in practically everything when it came to conventional weapons. Until the late seventies/early eighties, NATO wouldn't have a MBT powerful enough in the three main basic tank design areas (firepower, protection, and mobility) to provide the necessary tactical superiority on the battlefield in order to compensate for the numerical inferiority. However, designing such a weapon was easier said than done. Until then, no nation had been capable of developing a tank decisively superior in firepower, protection and mobility. The bottom line was that tank designers were forced to make compromises between weight and mobility, and this resulted, on the top of the scale, in tanks that had good firepower and an adequate protection, but rather poor mobility (like the British Chieftain), or on the other end of the scale, in tanks which had adequate firepower, mediocre protection, and good mobility (like the French AMX-30/32). The ability to build a tank which excelled in all three basic aspects of tank design was only possible through the incorporation of the new technologies that became available during the seventies. The way the US Army worked out the development of the new tank was very different than the way the German/American MBT-70 project was approached - instead of trying to build the best tank in the world, they opted for building the best tank within a limited budget. With this perspective in mind, the following directives were established, by order of priority: crew survivability; surveillance and target acquisition performance; first-round and subsequent hit probability; minimal time to acquire and hit; cross-country mobility; complementary armament integration; equipment survivability; crew environment; silhouette; acceleration and desaceleration; ammunition and stowage; human factors; production; operational range; speed; diagnostic maintenance aids; growth potential; support equipment; and transportability. In its quest for the best possible tank design and subsequent development at the lowest costs, the US Army opted for a competitive process between the Chrysler Corporation (which has built the M-60 series) and the General Motors Corporation (which has built the MBT-70), with allowance for alternative solutions. One of the main requirements was to reduce the unit costs compared to the failed MBT-70 project, and this defined what technologies were or were not to be used in the new tank. In June 1973 contractors were awarded to both the Chrysler Corporation (which has built the M-60 series) and the Detroit Diesel Allison Division of the General Motors Corporation (which has built the MBT-70) to built prototypes of a new tank designated M1, and later named the Abrams tank (after Gen. Creighton Abrams). These tanks were handed over to the US Army for trials in February 1976. In November 1976 it was announced after a four-month delay that the Chrysler tank would be placed in production. Production commenced at the Lima Army Modification Center at Lima in 1979 with the first production tanks being completed in 1980. To the left, one of the low-rate-initial-production M1 Tanks, named "Thunderbolt", after General Creighton Abrams' own tank, during World War 2. Right, another M1 from the LRIP program, painted in the old MERDC cammo scheme, at the Aberdeen Proving Grounds. The M1 design benefited, since the start, from special armor, thermal imaging sights, advanced gun fire controls, and turbine engines. The new special armor concept was developed by the British Army's research facility in Chobham, England, and was based on a classified system of layers of ceramic composites inside steel armor, mounted on top of a normal steel armor plate. This new armor, which became known as Chobham armor, offered exceptional protection against shaped charge warheads (ATGM's and HEAT ammunition). Consequently, the Ballistics Research Laboratory at Aberdeen Proving Grounds began a crash program to develop a similar improved armor to be incorporated into the new tank. The first production models of the basic M1 tanks issued to the US Army in 1981 weighed in at about sixty tons, combat loaded, and were equipped with normal steel armor plus a new composite special armor (which consisted of layers of both steel and non-steel armor plus heat and shock absorbing materials), capable of defeating HEAT rounds in addition to kinetic energy penetrators. Although the standard production M1 tanks were designed to accept the German Rheinmetall 120mm gun whenever necessary, they were armed with the same M68A1 105mm rifled gun used on the M60 MBT. The advent of more advanced 105mm ammunition, specially DU penetrators like the improved M833 round, capable of penetrate 420mm of RHA inclined at 60° at 2,000 meters, would make it possible to delay the main gun upgrade until 1985. The M1 was faster and more maneuverable than its predecessors in the M60 series, while offering a lower, smaller silhouette. Besides the substantial gains in performance, the Textron Lycoming AGT-1500 turbine engine was far more reliable than the diesel tank engines then in use with the Army. There was still another benefit. The engine change, despite a penalty in fuel consumption, also resulted in much quieter operation, so much so that soldiers encountering the tank in early maneuvers started calling it "Whispering Death". With all these assets, plus a new fire control system that incorporated all the latest technologies (comprising a laser range finder, ballistic computer, gunner's thermal-imaging day and night sight, a muzzle reference sensor to measure gun-tube distortion, and a wind sensor), the M1 Abrams was a gigantic leap forward. The M1A1 Abrams in Baghdad (Operation Iraqui Freedom, 2003). Improvements to the basic M1 Abrams were planned from the very beginning of its development to keep pace with the new Soviet tank designs. Thus, five models were produced. The original model, the basic M1, was produced from 1984 to January 1985. Total production: 2,374 tanks. The second model, produced from 1984 to 1986, was the Improved Performance M1 (IPM1). The IPM1 was produced to take advantage of various improvements from the M1A1 program, before the full M1A1 was ready for production. These improvements consisted of a reinforced new suspension, various transmission modifications, improved armor protection, and the redesigned M1A1 turret gun mount and bustle rack, among others. The added weight (one ton) decreased performance only slightly. The third model, the M1A1, or M1 with Block 1 Product Improvement, started in August 1985. In addition to the improvements fitted to the IPM1 tank, the M1A1's major asset was to be the German Rheinmetall 120mm smoothbore cannon. US studies on the gun concluded it was overly complex and expensive by American engineering standards, so a version using fewer parts was developed, and designated the 120mm M256 gun. Along with the new gun came a number of associated changes to the fire control system. Since the Korean War, the US Army found that the main tactical advantage in tank combat was the ability of seeing and engaging the enemy first - consequently, great emphasis was placed on getting the best acquisition technology possible, and as it turned out, the US pioneered all technologic improvements in this area, since the first image intensification night sights in the sixties, the thermal imaging during the seventies, and finally the millimeter wave multi-sensor of the nineties. The thermal sight had a dramatic effect during the Gulf War, since it enabled US tankers to see not only at night, but also through the "fog-of-war" and dismal weather conditions, like sand storms. The M1A1 Abrams shows it's firepower, putting the 120mm M256 gun into good use, at the firing range. The 120mm M256 gun of the M1A1 tank fires various types of ammunition, the most known being the M829A1 APFSDS-T ammunition (kinetic energy round with long rod penetrator, made of depleted uranium, with a muzzle velocity of 1,575 m/sec, and a maximum effective range of 3,500 meters, but engagement ranges approaching 4,000 meters were successfully demonstrated during Operation Desert Storm), also known as the "Silver Bullet" of Desert Storm fame. The M829A1 ammunition entered service in 1991. The Abrams also has an onboard digital fire control computer. Range data from the laser rangefinder is transferred directly to the fire control computer, which automatically calculates the fire control solution. The data includes 1) the lead angle measurement, 2) the bend of the gun measured by the muzzle reference system of the main armament, 3) wind velocity measurement from a wind sensor on the roof of the turret and 4) the data from a pendulum static cant sensor located at the center of the turret roof. Depleted uranium penetrators have density two and a half times greater than steel and provide high penetration characteristics, and a "pyrophoric" effect. When the DU penetrator hits a tank's armor, both the penetrator and armor partially liquefy under the tremendous pressure. Once the armour has been perforated, that part of the penetrator which has not melted, together with the molten armour and fragments that break away from the interior, ricochet inside the vehicle. This usually causes a fire, and if it reaches stored ammunition inside the tank, leads to catastrophic explosions. The new 120mm M256 gun, firing the M829A1 APFSDS-T (Armor Piercing, Fin Stabilized Sabot and Tracer) "Silver Bullet" ammunition proved to be extremely successful against Soviet and Chinese made tanks that got in the way of the M1A1 Abrams tanks during Operation Desert Storm. Other rounds include the M829 (an early version of the M829A1, which entered service by 1985), and the M830 High Explosive Anti-Tank (HEAT, which has a maximum effective range of 3,000 meters). Projectile (M829A1) lenght: 780 mm; weight: 4.9 Kg. Estimated penetration performance (M829A1): 610 mm at 2,000 meters. The next generation ammunition, called 120mm APFSDS-T M829A2, entered service in 1994, and is the current armor penetrator ammunition being produced by by the General Dynamics Ordnance and Tactical Systems for the 120mm M256 gun of tanks M1A1 and M1A2. It is a technology improvement over the M829A1, the "Silver Bullet" of Desert Storm fame. The new ammunition's performance gains, while classified, result from several new features. These include the use of a special manufacturing process to improve the structural quality of the depleted uranium penetrator. This, plus the use of new composites for the sabot, which, together with a new propellant, provide superior penetrator performance. Combined, these features increase the muzzle velocity of the M829A2 approximately 100 m/sec greater than the M829A1 (up to something around 1,675 m/sec), while operating at slightly lower pressure. Projectile length: 780 mm; weight: 4.6 Kg. Estimated penetration performance: 730 mm at 2,000 meters. The 120mm APFSDS-T M829A3 is the third generation of depleted uranium armor penetrator tank rounds. It will replace the M829A1 and the M829A2 projectiles. Although its armor penetration performance is classified, this round is considered as the most powerful anti-armor ammunition in the world. 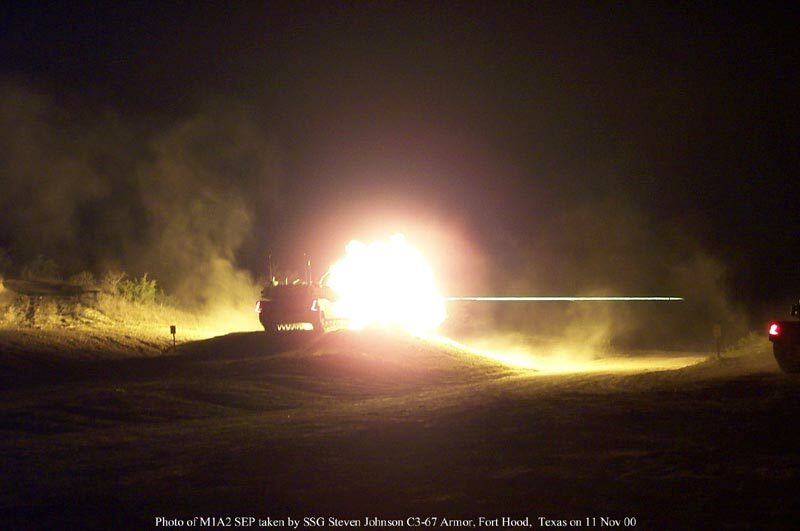 The M829A3 round will provide the M1A1 and M1A2 Abrams tanks with greater armor penetration capability than previous generation depleted uranium penetrator rounds while increasing accuracy, which translates as greater lethality at extended ranges. The long-rod kinetic energy penetrator weighs 10.0 Kg, and it's length is 924 mm. Muzzle Velocity: 1,555 m/sec. Estimated penetration performance: 765 mm at 2,000 meters. The 120mm APFSDS-T M829A3 was approved for production in 2003. Alliant Techsystems Inc. (ATK) will manufacture the composite sabot; load, assemble and pack the round; and provide logistics support. Production of the M829A3 occurs at ATK's manufacturing center of excellence in Rocket Center, West Virginia. Newer KE penetrators like the US M829A2 and now M829A3, have been improved to defeat the armor design of Kontakt-5, used on the T-80U and T-90S main battle tanks. The M829A2 was the immediate response, developed in part to take on this new ERA type. The M829A3 is a further improvement, designed to defeat any future armor protection methods like the newer Kaktus type, which is currently only seen on prototype tanks such as the T-80UM2 "Chiorny Oriol" (Black Eagle) tank. The M1A1 Abrams, since the beginning, has benefitted from composite armor. Composite armor uses various materials different hardness and elasticity, heat and shock absorbing materials, layered and sandwiched together, to provide improved protection against specific threats, such as multiple-hits of Kinetic Energy (KE), and Chemical Energy (CE) ammunition. Composite passive armor is designed to absorb the energy of the impact, and prevent penetration and internal damage by the penetrating projectile or its residual effects. Composite armor is usually provided in modules or tiles, which are composed of a mosaic of hard (ceramic) materials, soft but strong (composite fibers) embedded in concrete matrixes. The frontal plan is usually covered with softer material, such as rubber or other composites, which are used to dissipate the initial impact and minimize the damage to the internal mosaic, thus retaining its multi-hit protection capability. One of the most interesting modifications of the M1A1 series was the new armor composite including depleted uranium (DU) plate. This armor greatly increased resistance against kinetic energy rounds. During the Gulf War, M1A1 tanks could directly engage enemy tanks while in the enemy's line-of-sight with little risk from any eventual damage from incoming retaliatory fire. This means that M1A1 tanks could hit their targets, while Iraqi tanks couldn't hit, or, if they hit, couldn't damage M1A1 tanks. Also, due to DU armor, not a single US tank was penetrated from enemy fire. US tanks took many close direct hits from Iraqi Soviet-made T-72 and T-72M tanks, but enemy rounds were simply not able to penetrate the M1A1 tank's armor. The model that had this feature was called M1A1 HA (Heavy Armor), and had a protection equivalent to 600 mm against kinetic energy ammunition (APFSDS), and 1,300 mm against chemical energy warheads (ATGM's and HEAT ammunition). The armor protection of today's M1A1 Abrams models is much better than that of the original M1A1 HA tanks that saw combat during the Gulf War (1991). RHAe = Rolled Homogeneous Armor Equivalent; an equivalent RHA thickness of a given armor type against a given armor piercing ammunition or missile (i.e. Kinetic Energy penetrators, like APFSDS DU long-rod penetrators or Chemical Energy projectiles, like HEAT ammunition and ATGM's). Modern composite (Chobham) armor may be several times more efficient against Chemical Energy than RHA of the same thickness. Source: Tank Protection Levels web site. During the Gulf War only 18 Abrams tanks were taken out of service due to battle damage: nine were permanent losses, and another nine suffered repairable damage, mostly from mines. Not a single Abrams crewman was lost in the conflict, while inside the protection of the M1A1's armor, by enemy fire. Casualties did occur, but in all known cases, the cause was fratricide from other US weapons. There were few reports of mechanical failure. US armor commanders maintained an unprecedented 90% operational readiness for their M1A1 Abrams Main Battle Tanks. The Abrams has been using Depleted Uranium (DU) armor since 1988. In 1996, a design change to the armor package was made by the Army and cut-in to production by General Dynamics Land Systems (GDLS) via Change Request XMPP-2083 in Oct 96 and effective with Job #1 M1A2 Phase II AUT. The use of DU armor is a primary feature that distinguishes the Abrams tank from numerous other commonly accepted equipment employed by the military and industry. The current use of the depleted uranium (DU) armor package on the M1 Abrams Main Battle Tank (MBT) Heavy Armor System has been re-evaluated to determine whether the environmental impacts of its continued use remain insignificant, taking into consideration the current use of the tank and the Nuclear Regulatory Commission's (NRC's) reduction in allowable radiation exposure from 500 mrem/year to 100 mrem/year for tank and maintenance crews (individual members of the public). As in already-fielded weapon system, M1 MBTs have been in production and in the field since the early 1980s. During that time, many technical, environmental and health assessments have been completed. These documents have addressed and minimized environmental impacts. Location: Marine Corps Base, Camp Lejeune, North Caronina, USA. Photo: Courtesy of the USMC. M1A1 Abrams: The Backbone of the US Heavy Armored Force. The M1A1 Abrams is still the backbone of the US heavy armored force; 4,796 M1A1 tanks were built for the US Army, 221 for the US Marines and 555 co-produced with Egypt. Egypt has ordered a further 200 M1A1 tanks with production to continue to 2005. The M1A1 Abrams Tank Firepower Enhancement Program (FEP), a Marine Corps Systems Command initiative, is intended to increase the all weather, day and night target acquisition and engagement ranges and provide a far target location capability for the M1A1 Tank. The FEP system will include a scope of work that entails a suite of upgrades for the M1A1 Tank. These upgrades include a second-generation thermal sight and a north finding/target locating capability. The system will increase the tank crew's ability to detect, recognize, identify and accurately locate targets. Under the Firepower Enhancement Package, DRS Technologies has been awarded a contract for the GEN II TIS to upgrade US Marine Corps M1A1 tanks. Also in production is the Tungsten Kinetic Energy Anti-Tank Ammunition, by the General Dynamics Ordnance and Tactical Systems. There are two types of tungsten ammunition available, the first being the Terminator (KEW) APFSDS-T: the "Terminator" is a close variant to the M829A1 ("Silver Bullet"). The Terminator is specifically configured for high-end performance in the hot extremes of the desert and is compatible with all standard NATO 120mm smoothbore tank cannons. The second tungsten penetrator ammunition type is the DM43A1 APFSDS-T: providing the greatest level of performance available, the DM43A1 is the product of a cooperative program between General Dynamics Ordnance and Tactical Systems and Rheinmetall GmbH of Germany, this cartridge also is compatible with all standard NATO 120mm smoothbore tank cannons. The Force XXI: Digitization and the M1A1D. The M1A1 fleet remains the majority of the US Armor Force. The M1A1D is a digitized M1A1 that provides improved situational awareness and far target designate capability. The installation of a digital appliqué command and control package on the M1A1 is necessary to achieve Force XXI required capabilities. Another planned improvement is replacing the analog Turret Network Box (TNB) and Hull Network Box (HNB) with new digital units to eliminate the associated obsolescence problems and to allow the introduction of a built-in-test (BIT) capability to support the Force XXI maintenance structure. Digital TNB's and HNB's also allow future electronic growth by providing unpopulated VME card slots. In the survivability area the Army is working to develop and field a contingency armor package that is thin and lightweight, but with a high level of protection. These armor packages can be applied to either the side or front of Abrams tanks to provide additional protection as required by the mission. The Army is also seeking to fund resource upgrades to the M1A1 fire control system with the same 2nd Gen FLIR package on the M1A2. The Army initiated an innovative M1A1 rebuild program in 1999 known as Abrams Integrated Management (AIM). In a partnership with the Anniston Army Depot in Anniston, Alabama, General Dynamics Land Systems is engaged in a refurbishment program of more than 1,000 M1A1 Abrams tanks. Under a unique partnership agreement private and public industry cooperate in the rebuilding the U.S. Army oldest M1A1's to a like-new condition by maximizing their core skills and capabilities. The Abrams Integrated Management (AIM) Overhaul Program is an innovative teaming of the prime contractor, GDLS, and Anniston Army Depot (ANAD) to refurbish the tank to a like-new condition. The AIM Overhaul is the Army's under-funded program to sustain the nearly 7,000 Abrams Tanks as part of the total recapitalization plan. AIM is funded at 135 tanks per year which translates into a 12-year rebuild cycle for the active component. As the M1A2 fleet ages, the Army must expand AIM to include about 90 M1A2 SEPs per year beginning in 2012. With a 20-year rebuild cycle for the reserve component, the Army must implement a 90 tank per year program beginning in 2006. Exploiting the unique strengths of both the manufacturer and the Army depot, the tank is completely remanufactured resulting in a nearly new tank. AIM Overhaul increases readiness, reduces operations and support costs, standardizes configuration, and minimally sustains the Abrams industrial base. The first M1A1s are now 15-years old and will approach 50-years old by the time the Army ultimately replaces them. With old equipment, sustainment is only part of the challenge; the Army must also maintain combat overmatch. M1A1 tanks enter the process at Anniston Army Depot, Alabama, where the entire vehicle is completely disassembled with each component cleaned, inspected and evaluated for rebuilding, refurbishment, or complete replacement. While many of the rebuild components stay at Anniston, other parts are sent to one of several rebuild sites. These sites include General Dynamics' facilities in Scranton, Pennsylvania, Muskegon, Michigan, as well as other Army depots. Turret and hull subsystems are first worked on at Anniston and then shipped to Lima, Ohio, where the tank is reassembled, tested and accepted back into the Army's fleet. AIM alone is a sustainment process only and does not insert new technologies nor address obsolescence. However, by exploiting the synergy created by integrating the AIM program with a viable Abrams recapitalization program, the Army has a cost-effective opportunity to apply and field these high-payoff projects. The current high-payoff projects include 2nd Generation FLIR, frontal & side armor upgrades, Vehicle Integrated Defense System (VIDS), digital turret & hull networks boxes with built-in test, and a new engine.The AIM Overhaul program is the optimum time/location to complete applied improvements. The AIM Overhaul program in its objective state will produce M1A1Ds. Currently the process applies many product improvements with some M1A1s receiving the M1A1D configuration retrofitted in the field. The first year production of 45 tanks was completed in June 2000. Since inception the program has returned over 275 M1A1 tanks - as of November 2002 - in a like-new, zero mileage condition. The U.S. Army plans to fund the program over the next ten years at a rate of 135 tanks per year. The Army's Abrams modernization strategy includes a new tank engine program, the LV-100, the AIM program and a parts obsolesce program to reduce the operations and support costs and logistics footprint associated with the Abrams tank. These initiatives are funded by the Army to sustain its tank fleet over the next 25 years. The M1A2 Abrams Main Battle Tank. The M1A2 Abrams System Enhancement Program (SEP). The M1A2 SEP (System Enhancemen Program), is the digital battlefield centerpiece for Army XXI. It is the heavy force vehicle that will lead Armor into the next century and transition the close combat mission to the Future Combat System (FCS). The M1A2 SEP is an improved version of the M1A2. It contains numerous improvements in command and control, lethality and reliability. The M1A2 System Enhanced Program is an upgrade to the computer core that is the essence of the M1A2 tank. The SEP upgrade includes improved processors, color and high resolution flat panel displays, increased memory capacity, user friendly Soldier Machine Interface (SMI) and an open operating system that will allow for future growth. Major improvements include the integration of the Second Generation Forward Looking Infared (2nd Gen FLIR) sight, the Under Armor Auxiliary Power Unit (UAAPU) and a Thermal Management System (TMS). The mission of the M1A2 Abrams tank is to close with and destroy enemy forces using firepower, maneuver, and shock effect. The M1A2 is being fielded to armor battalions and cavalry squadrons of the heavy force. During the Army's current M1A2 procurement program about 1,000 older, less capable M1 series tanks will be upgraded to the M1A2 configuration and fielded to the active forces. There is currently no plan to field the M1A2 to the ARNG. In 1999, the Army started upgrading M1s to the M1A2 System Enhancement Program (SEP) configuration. This sensor also will be added to older M1A2 starting in 2001. When the SEP enter production, all older M1A2 will eventually be converted to the SEP configuration. Further M1A2 improvements, called the System Enhancement Program (SEP), are underway to enhance the tank's digital command and control capabilities and to to improve the tank's fightability and lethality. M1A2 SEP tanks were scheduled to begin fielding in 2000. The M1A2 System Enhanced Program (SEP) is an upgrade to the computer core that is in essence of the M1A2 tank. The SEP upgrade includes improved processors, color and high resolution flat panel displays, increased memory capacity, user friendly Soldier Machine Interface (SMI) and an open operating system that will allow for future growth. Major improvements include the integration of the Second Generation Forward Looking Infared (2nd Gen FLIR) sight, the Under Armor Auxiliary Power Unit (UAAPU) and a Thermal Management System (TMS). The 2nd Generation Forward Looking InfraRed sighting system (2nd Gen FLIR) will replace the existing Thermal Image System (TIS) and the Commander's Independent Thermal Viewer. The incorporation of 2nd Gen FLIR into the M1A2 tank will require replacement of all 1st Gen FLIR components. From the warfighter perspective, this is one of the key improvements on the SEP. The 2nd Gen FLIR is a fully integrated engagement-sighting system designed to provide the gunner and tank commander with significantly improved day and night target acquisition and engagement capability. This system allows 70% better acquisition, 45% quicker firing and greater accuracy. In addition, a gain of 30% greater range for target acquisition and identification will increase lethality and lessen fratricide. The Commander's Independent Thermal Viewer (CITV) provides a hunter killer capability. The 2nd GEN FLIR is a variable power sighting system ranging from 3 or 6 power (wide field of view) for target acquisition and 13, 25 or 50 power (narrow field of view) for engaging targets at appropriate range. Changes to the M1A2 Abrams Tank contained in the System Enhancement Program (SEP) and "M1A2 Tank FY 2000" configuration are intended to improve lethality, survivability, mobility, sustainability and provide increased situational awareness and command and control enhancements necessary to provide information superiority to the dominant maneuver force. The System Enhancement Program (SEP) allows for digital data dissemination with improved ability to optimize information based operations and maintain a relevant common picture while executing Force XXI full dimensional operation. This enhancement increases capability to control the battlefield tempo while improving lethality and survivability. Finally to ensure crew proficiency is maintained, each Armor Battalion is fielded an improved Advanced Gunnery Training System (AGTS) with state-of-the-art graphics. A really impressive picture of a M1A2 SEP firing at night. Photo courtesy of SSG Steven Johnson, C3-67 Armor, Fort Hood, Texas on November 11, 2000. Click HERE to see the full-sized image! improve target detection, recognition and identification with the addition of two 2nd generation FLIR's. incorporate an under armor auxiliary power unit to power the tank and sensor suites. incorporate a thermal management system to provide crew and electronics cooling. increase memory and processor speeds and provide full color map capability. provide compatibility with the Army Command and Control Architecture to ensure the ability to share command and control and situational awareness with all components of the combined arms team. Additional weight reduction, embedded battle command, survivability enhancement, signature management, safety improvement, and product upgrade modifications to the M1A2 will comprise the "M1A2 Tank FY 2000" configuration. Initial fielding of the M1A2 to the Army's 1st Cavalry Division, Fort Hood, Texas, was completed in August 1998. Fielding to the 3rd Armored Cavalry Regiment, Ft. Carson, Colorado is ongoing. Deliveries of the M1A2 (SEP) tank began in August 1999 and fielding began in the third quarter fiscal year 2000. A multi-year contract for 307 M1A2 Abrams Systems Enhancement Program (SEP) tanks was awarded in March 2001 with production into 2004. The current Army plan allows for a fleet of 588 M1A2 SEP, 586 M1A2 and 4,393 M1A1 tanks. The potential exits for a retrofit program of 129 M1A2 tanks to the SEP configuration between 2004 and 2005. Initial fielding of the M1A2 to the Army's 1st Cavalry Division, Fort Hood, Texas, was complete by August 1998. Fielding to the 3rd Armored Cavalry Regiment, Ft. Carson, Colorado ended in 2000. Fielding of the M1A2 (SEP) began in spring 2000 with the 4th Infantry Division, Fort Hood, Texas, and continues. Rolling over of the 1st Cavalry Division's M1A2 tanks to new M1A2 (SEP) tank began in 2001 and continues. Increased funding for Stryker and Future Combat Systems (FCS) came as a result of Army decisions in 2002 to terminate or restructure some 48 systems in the FY '04-'09 Program Objective Memorandum (POM) long-term spending plan. Among the systems terminated were: United Defense's Crusader self-propelled howitzer and the A3 upgrade for the Bradley Fighting vehicle, GD's M1A2 Abrams System Enhancement Program, Lockheed Martin's Army Tactical Missile System Block II and the associated pre-planned product improvement version of Northrop Grumman's Brilliant Anti-armor (BAT) munitions, Raytheon's Stinger missile and Improved Target Acquisition System, and Textron's Wide Area Mine. The US Army planned to procure a total of 1150 M1A2 SEP tanks, however future Army budget plans suggest that funding may not be available after 2004. The US Army decided to cancel future production of the M1A2 SEP from FY2004, but in June 2005 ordered the upgraded of a further 60 M1A2 tanks to SEP configuration. Under the Firepower Enhancement Package (FEP), DRS Techologies has also been awarded a contract for the GEN II TIS to upgrade US Marine Corps M1A1 tanks. GEN II TIS is based on the 480 x 4 SADA (Standard Advanced Dewar Assembly) detector. The FEP also includes an eyesafe laser rangefinder, north-finding module and precision lightweight global positioning receiver which provide targeting solutions for the new Far Target Locate (FTL) function. FTL gives accurate targeting data to a range of 8,000m with a CEP (Circular Error of Probability) of less than 35m. The AGT 1500 engine has served the Abrams tank well. It afforded a significant combat edge due to its lightweight, power, and stealth. However, the AGT 1500 is getting old and the fleet faces problems in maintaining this workhorse. The AGT 1500 represents 1960's technology and has been out of production since 1992. Declining reliability causes the engine to account for around 64% of the Abrams tank reparable O&S costs. The Army is focusing on the engine as a major element in easing the maintenance burden for the force while substantially reducing O&S costs. PM Abrams has developed a two-phased program to improve engine readiness and lower costs. The first phase makes innovative use of a partnership with PM/AMC/industry to overhaul the existing AGT 1500 engine/components. This program is termed PROSE (Partnership for Reduced O&S Costs, Engine). Under PROSE, the government will "team" with the original equipment manufacturer to reengineer the production process and improve field support. The contractor provides quality parts and expert technical support, and the government (via its depots) provides the skilled labor and facilities. The second phase of the engine initiative involves replacing the AGT 1500 engine with a new engine. There is great potential for improved tank readiness and long term O&S cost reduction in the implementation of this phase. This approach will not be cheap and will require a major decision by the Army. A 2 billion-dollar investment is required to replace the current engine with a new engine in the active component along, with a potential savings of 13 billion over the remaining life of the tank. The PROSE process is expected to improve reliability by 30%. The benefits of the new engine are much more dramatic - the Army could achieve a 4-5 fold improvement in reliability, hopefully a 35% reduction in fuel consumption, a 42% reduction in the number of parts, and a 15-20% improvement in vehicle mobility. Life cycle engine O&S costs are projected to drop from 16 billion dollars over 30 years with the current engine to 3 billion dollars with the new engine. Last news on the new engine: The US Army has selected Honeywell International Engines and Systems and General Electric to develop a new LV100-5 gas turbine engine for the M1A2. The new engine is lighter and smaller with rapid acceleration, quieter running and no visible exhaust. The second piece of our O&S cost reduction strategy is the Abrams Integrated Management (AIM) program. The AIM process overhauls an old M1A1 tank to original factory standards, applying all applicable MWO's. The AIM Proof of Principle was completed in 1997, proving the cost-effectiveness of the concept and helping to define the scope. The AIM tank demonstrated an 18% O&S cost savings when compared to non-AIM tanks. The AIM overhaul concept is a cost-effective solution to address the problems of rising tank sustainment costs and increasing readiness concerns. A series of live firing tests of the LAHAT - Laser Guided anti-tank missile developed by IAI/MBT (Israel Aircraft Industries-MBT Division) included the firing of 120mm missiles, adapted for smooth-bore guns used on Merkava Mk3, Merkava Mk4, Leopard 2A4/5/6 and M1A1/A2 Abrams tanks. The missile's trajectory can be set to match either tank (top attack) or helicopter (direct attack) engagement. Furthermore, the missile uses a tandem warhead which can defeat modern armour and reactive panels. The main warhead has a high penetration capability, defeating all known armored vehicles at high impact angles typical of top attack trajectories. The missile is designed for employment from 105mm - 120mm tank guns, as well as from launch tubes. M1A1 Abrams firing APFSDS round. Upgrading the M1A1 and M1A2 Abrams tanks from the US M256 gun to the new Rheinmetall 120mm L55 gun: The first aspect to be considered is that the US M256 120mm gun (same as the German Rheinmetall 120mm L44 gun of the Leopard 2 - up to the A5 version - adapted to American engineering standards, and made under license in the US), firing the M829 APFSDS depleted uranium penetrator develops, within very close tolerances, the same kinetic energy as the German L55 firing tungsten penetrators (around 18-20 megajoules). However, there are other aspects that must be considered, rather than pure kinetic energy. What has to be the first concern here - speaking about APFSDS ammunition - are both the flight phase and the penetration phase behavior of the long rod penetrator. During the flight phase the key is how stable the penetrator is and how much kinetic energy it retains. The penetration phase behavior is crucial, as this is when the kinetic energy is transferred to the target. The long rod penetretor must remain stable on impact, must resist shearing and should provide post penetration phase effects (i.e. spalling, pyrophoric effects, etc.). Because of those issues, it is not simple - as it may seem at a first glance - to replace the 120mm L44 gun with the L55. A lot of testing will have to be done to ensure the M829 (depleted uranium) munitions will behave properly when fired from the 120mm L55 gun. Anyway, the chances are that no gun upgrade will be done on the Abrams tanks in the near future, since at the present stage of depleted uranium alloy technology the performance of the US M256 L44 gun firing depleted uranium penetrators is still superior to that of the German Rheinmetall L55 gun firing tungsten penetrators. In June 2004, DRS Technologies was awarded a contract to provide systems including rugged appliqué computers for the M1A2 Abrams tanks (and M2A3 Bradley fighting vehicles) as part of the US Army's Force XXI Battle Command, Brigade and Below (FBCB2) program. FBCB2 is a digital battle command information system which provides enhanced interoperability and situation awareness from brigade to individual soldier that will be used in conjunction with the Army's Tactical Internet. The M1A2 Abrams with the TUSK upgrade. The Tank Urban Survival Kit, or TUSK, is a series of improvements to the M1A2 Abrams intended to improve fighting ability in urban environments. Historically, urban and other close battlefields have been the worst place for tanks to fight as the design of all Main Battle Tanks of the 3rd generation had to maximize the balance between armor/weight/mobility; and as a result the front armor is much stronger than that on the sides, top, or rear. However, in an urban environment, attacks can come from any direction, and attackers can get close enough to reliably hit weak points in the MBT's armor, or get sufficient elevation to hit the top armor square on. Armor upgrades include reactive armor on the sides of the tank and slat armor (similar to that on the Stryker) on the rear to protect against rocket-propelled grenades and other shaped charge warheads. This upgrade also includes reactive armor or explosive reactive armour (ERA), to be applied on the Abrams' side skirts, to lessen the damage from explosions caused from ATGMs warheads, exploding shells, grenades, or dropped bombs. A gun shield and a thermal sight system are added to the loader's top-mounted 7.62 mm machine gun, and the mount for commander's .50-caliber heavy machine gun is modified to allow the weapon to be operated from within the turret with the hatch closed (the original M1 and M1A1 had this capability, but it was lost on the M1A2 due to the reconfiguration of several turret systems). An exterior telephone allows supporting infantry to communicate with the tank commander. The TUSK system is a field-installable kit that allows tanks to be upgraded without needing to be recalled to a maintenance depot. The Abrams accommodates a crew of four, the commander, driver, gunner and loader. The commander and gunner are seated on the right hand side, the loader is on the left and the driver is seated at the center front of the tank. M1A1 Abrams, firing the M256 120mm gun. The main armament is the 120 mm smoothbore gun, US designation code M256, developed by Rheinmetall GmbH of Germany. The system manager for the 120 mm ammunition is Alliant Techsystems of Hopkins, Minnesota with second source by Olin Ordnance of St Petersburg, Florida. The 120 mm gun fires the following ammunition: the M865 TPCSDS-T and M831 TP-T training rounds, the M8300 HEAT-MP-T and the M829 APFSDS-T which includes a depleted uranium penetrator. Depleted uranium has density two and a half times greater than steel and provides high penetration characteristics. The commander has a 12.7 millimeter (0.50 inch) caliber Browning M2 machine gun on a powered rotary platform and equipped with a x3 magnification sight. The elevation is from -10 to +65 degrees and the traverse is 360 degrees. Starting with the M1A2 this powered platform and sight gave way to a larger commander's cupola and a manually operated machine gun mount. So, from the M1A2 onwards, the commander has to open the hatch and use the machine guns iron sights to engage targets. This was done because the room formerly taken up by the sight, the platform power assembly and the controls is now taken up by the CID and the thermal viewer. The loader has a 7.62 caliber M240 machine gun on a Skate mount. The elevation of the M240 is from -30 to +65 degrees and the traverse rotation is 265 degrees. A 7.62 mm M240 machine gun is also mounted co axially on the right hand side of the main armament. On both sides of the turret the tank is fitted with six-barrelled smoke grenade dischargers, model L8A1, designation M250. A smoke screen can also be laid by an engine operated system. The commander is responsible to the platoon leader and signed equipment, the reporting of logistical needs, and the tactical employment of his tank. He briefs his crew, directs the movement of the tank, submits all reports, and supervises initial first-aid treatment and evacuation of wounded crewmen. He is an expert in using the tank's weapon systems, requesting indirect fires, and executing land navigation. The commander must know and understand the company mission and company commander's intent. He must be prepared to assume the duties and responsibilities of the platoon leader or PSG in accordance with the succession of command. These requirements demand that the commander maintain situational awareness by using all available optics for observation, by eavesdropping on radio transmissions, and by monitoring the inter vehicular information system (IVIS) or appliqué digital screen (if available). The commander is seated on the right hand side of the turret. The commander's station is equipped with six periscopes which provide all round 360 degree view. The Independent Thermal Viewer from Texas Instruments provides the commander with independent stabilized day and night vision with a 360 degree view, automatic sector scanning, automatic target cueing of the gunner's sight with no need for verbal communication, and back-up fire control. The system consists of a gyrostabilized head housing the sensors, a hand control grip with a panel for selecting parameter settings, an electronics unit and a remote cathode ray tube display. The range of the viewer is -12 to +20 degrees in elevation and 360 degrees in azimuth. The magnification is x2.6 at 3.4 degrees narrow field of view and x7.7 at 10.4 degrees wide field of view. M1A1 Abrams cut out drawing. The gunner searches for targets and aims and fires both the main gun and the coaxial machine gun. He is responsible to the commander for the maintenance of the tank's armament and fire control equipment. The gunner serves as the assistant commander and assumes the responsibilities of the commander as required. He also assists other crew members as needed. Several of his duties involve the tank's communications and internal control systems: logging onto and monitoring communications nets; maintaining digital links if the tank is equipped with the IVIS or appliqué digital system; inputting graphic control measures on digital overlays; and monitoring digital displays during the planning and preparation phases of an operation. The gunner is seated on the right hand side of the turret . The Gunner's Primary Sight-Line of Sight, GPS-LOS, has been developed by the Electro-Optical Systems Division of Hughes Aircraft Company. The M1 and M1A1 Abrams tank have a GPS-LOS with a single axis stabilized head mirror. The system has daylight optics with x10 magnification narrow field of view and x3 magnification wide field of view, and unity magnification close-in surveillance with 18 degrees field of view. The night vision Thermal Imaging System, TIS, from Hughes has magnification x10 narrow field of view and x3 magnification wide field of view. The Thermal Imaging System creates an image based on the differences of heat radiated by objects within the field of view. The thermal image is displayed in the eyepiece of the gunner's sight together with the range measurement from a Hughes laser range finder. The M1A2 Abrams tank has a two-axis GPS-LOS which significantly increases the first round hit probability by providing faster target acquisition and improved gun pointing. The azimuth inertial stabilization allows target detection, recognition and acquisition at longer ranges than the single axis system. The Line of Sight excursion range is -16 to +22 degrees in elevation and + or - 5 degrees in azimuth. The stabilization accuracy is less than 100 microrads, and the bore sight retention is less than 100 microrads. The gunner has a Kollmorgen Model 939 auxiliary sight with magnification x8 and field of view 8 degrees. The fire control computer is supplied by Computing Devices Canada of Ontario. The digital fire control computer consists of an electronics unit and a data entry and test panel. The range data from the laser range finder is transferred to the fire control computer. The fire control computer automatically takes data to calculate the fire control solution. The data includes i) the lead angle measurement, ii) the bend of the gun measured by the muzzle reference system of the main armament, iii) wind velocity measurement from a wind sensor on the roof of the turret and iv) the data from a pendulum static cant sensor located at the center of the turret roof. The operator manually inputs the data on the ammunition type and temperature, and the barometric pressure. The driver moves, positions, and stops the tank. While driving, he constantly searches for covered routes and for covered positions to which he can move if the tank is engaged. He maintains his tank's position in formation and watches for visual signals. If the tank is equipped with a steer-to indicator, the driver monitors the device and selects the best tactical route. During engagements, he assists the gunner and commander by scanning for targets and sensing fired rounds. The driver is responsible to the commander for the automotive maintenance and refueling of the tank. He assists other crewmen as needed. The driver's station at the center front of the vehicle is equipped with a monitoring panel showing the condition of vehicle fluid levels, batteries and electrical equipment. The driver has either three observation periscopes or two periscopes on either side and a central image intensifying periscope for night vision. The periscopes provide 120 degrees field of view. The driver's night vision equipment enables the tank to maneuver at normal daytime driving speeds in darkness and in poor visibility conditions such as in dust, smoke and in battlefield obscurants. The Driver's Vision Enhancer, AN/VSS-5, developed for the US Army Communications and Electronics Command by Texas Instruments, is based on a 328 x 245 element uncooled detector array, working in the 7.5 to 13 micron waveband. The AN/VSS-5 provides a 30 degree elevation and 40 degree azimuth field of view. The field of regard is given as -50 to +20 degrees in elevation, and + or - 190 degrees in azimuth. A Driver's Thermal Viewer, AN/VAS-3, developed by the Electro-Optical Systems Division of the Hughes Aircraft Company, is installed on the M1A2 Abrams tanks for Kuwait. The AN/VAS-3 is based on a 60 element cadmium mercury telluride, CdHgTe, detector operating in the wavelength band 7.5 to 12 microns. The cooling is provided by a Split Stirling 0.25 watt engine. The field of view is 40 degrees azimuth x 20 degrees elevation, and the field of regard is given as 100 degrees in azimuth and 40 degrees in elevation. The loader loads the main gun and the coaxial machine gun ready box; he aims and fires the loader's machine gun. He stows and cares for ammunition and is responsible to the commander for the maintenance of communications equipment. Before engagement actions are initiated, the loader searches for targets and acts as air or antitank guided missile (ATGM) guard. He also assists the commander as needed in directing the driver so the tank maintains its position in formation. He assists other crew members as necessary. Because the loader is ideally positioned both to observe around the tank and to monitor the tank's digital displays, platoon leaders and commanders should give strong consideration to assigning their second most experienced crewman as the loader. Loading of the coaxial machine gun, as well as the stowage and care of ammunition, becomes the duty of the gunner. The absence of a loader also means the commander assumes a greater degree of responsibility for air and ATGM watch. The gunner aligns the reticule in the Gunner's Primary Sight with the target. The range is determined by the laser rangefinder and the range data is transferred to the fire control computer. The gunner's sight displays a ready-to-fire indication together with symbology from the fire control computer and system operational status. The gunner checks the alignment of the reticule in the Primary Sight with the target and the ready to fire indication and fires the gun. The hull and turret of the M1 are protected by advanced armour similar to the Chobham armour developed by the UK Ministry of Defence. The survivability of the M1/M1A1 main battle tank has been battlefield proven. The tanks survived without damage after sustaining direct hits by T-72 tank rounds. Of 1,955 Abrams M1A1 tanks in battle, no crew members were killed by enemy fire, four tanks were disabled and four tanks were damaged but were repairable. The M1A1 tank incorporates steel encased depleted uranium armour. The depleted uranium provides a higher level of protection against anti-tank weapons. The stowage for the main armament ammunition is in armored ammunition boxes behind sliding armour doors. Armour bulkheads separate the crew compartment from the fuel tanks. The tank is equipped with an automatic Halon fire extinguishing system which is activated within 2 milliseconds of a fire outbreak and extinguishes a fire within 250 milliseconds. The top panels of the tank are designed to blow outwards in the event of penetration by a HEAT projectile and access doors which are kept in the closed position provide protection for the crew. The loader has to depress and hold a switch to open the access doors: the doors close automatically when the switch is not depressed. The tank is protected against nuclear, biological and chemical (NBC) warfare and is equipped with a 200 SCFM, clean conditioned air system, a Radiac Radiological Warning Device, AN/VDR-1, and a chemical agent detector. The crew are equipped with protective suits and face masks. The M1 is equipped with an AGT 1500 gas turbine engine from Lycoming Textron. The Allison Transmission, X-1100-3B, provides four forward and two reverse gears. The M1 will need approximately 300 gallons every eight hours; this will vary depending on mission, terrain, and weather. A single tank takes 10 minutes to refuel. Refueling and rearming of a tank platoon - four tanks - takes approximately 30 minutes under ideal conditions. A mine plough will increase the fuel consummation rate of a tank by 25 percent. Drawings: General Dynamics Land Systems Web site. Data: FAS Land Warfare Systems. STERLING HEIGHTS, Mich., Aug. 28, 2007 - The U.S. Army TACOM Lifecycle Management Command has awarded General Dynamics Land Systems a $20 million delivery order as part of a $37 million contract to reset 36 M1A1 Abrams Integrated Management (AIM) main battle tanks. The reset process restores used equipment to combat level capability. The reset tanks will feature improved technology that will bolster crew situational awareness. The upgrades include second-generation Forward-Looking Infrared, Far Target Locate, a tank-infantry phone and driver's vision enhancement. The improvements increase the M1A1 Abrams tank's fighting capability by providing soldiers with an electronic graphic of the battlefield that features icons for friendly and enemy forces and provides a tank commander's thermal sight for the .50 caliber machine gun. Work will be performed in Anniston, Ala.; Tallahassee, Fla., Lima, Ohio; and Scranton, Pa., by existing General Dynamics employees, and is expected to be completed by November 2008. General Dynamics, headquartered in Falls Church, Va., employs approximately 82,900 people worldwide and anticipates 2007 revenues of approximately $27 billion. The company has leading market positions in mission critical information systems and technologies, land and amphibious combat systems, shipbuilding and marine systems, and business aviation. More information about the ompany is available on the Internet at http://www.generaldynamics.com. STERLING HEIGHTS, Mich., June 13, 2007 - General Dynamics Land Systems, a business unit of General Dynamics (NYSE: GD), has been awarded nearly $18 million for work on the U.S. Army's Abrams main battle tank and Stryker eight-wheeled combat vehicle. The U.S. Army Tank-Automotive and Armaments Command, Warren, Mich., awarded the company a $7.3 million contract modification for Systems Technical Support (STS) for the Abrams tank program. STS funds engineering studies on Abrams tanks to identify improvements and change-out obsolete parts, while keeping the tanks current to their respective base configurations. The STS program's objective is to maintain high operational readiness. The work will be performed in Sterling Heights by the existing workforce through December 31, 2011. The U.S. Army also awarded General Dynamics a $10.5 million contract for Stryker Brigade Combat Team logistics support. This work will be performed by existing employees in Sterling Heights (17 percent); Fort Lewis, Wash. (30 percent); Germany (8 percent); Iraq (14 percent); Kuwait (2 percent); and London, Ontario, Canada (29 percent). The work is expected to be completed by July 29, 2008. STERLING HEIGHTS, Mich., June 1, 2007 - The U.S. Army TACOM Life Cycle Management Command on May 25 awarded General Dynamics Land Systems, a business unit of General Dynamics (NYSE: GD), a $12 million contract modification for Abrams tank system technical support (STS). STS funds engineering studies on Abrams tanks with the purpose of identifying improvements and conducting the change-out of obsolete parts, while keeping Abrams main battle tanks current to their base configurations. The STS program's objective is to maintain Abrams tanks at high operational readiness rates. Existing General Dynamics Land Systems employees will perform the work in Sterling Heights, Mich. It is expected to be complete by December 31, 2011. General Dynamics, headquartered in Falls Church, Virginia, employs approximately 82,600 people worldwide and had 2006 revenues of $24.1 billion. The company is a market leader in business aviation; land and expeditionary combat systems, armaments and munitions; shipbuilding and marine systems; and information systems and technologies. More information about the company is available online at http://www.generaldynamics.com . STERLING HEIGHTS, Mich. March 07, 2007 - The U.S. Army TACOM Lifecycle Management Command has awarded General Dynamics Land Systems, a business unit of General Dynamics (NYSE: GD), three contract modifications totaling approximately $70 million for combat vehicle-related work. Two contract modifications were awarded for Stryker combat vehicle reset work. The first, valued at $43 million, relates to supporting the reset of the 3rd Brigade, 2nd Infantry Division, Fort Lewis, Wash. Work will be performed by existing General Dynamics employees in Sterling Heights; London, Ontario, Canada; and Fort Lewis, Wash. The work is expected to be completed by June 2008. A second contract modification for $5 million is for reset work in Balad, Iraq. Work will be performed by existing employees in Sterling Heights, London and Iraq and is expected to be completed by February 2008. Through the reset program, vehicles are serviced, repaired and modified to a pre-combat condition. Service technicians also apply modifications to bring the Strykers to the latest configuration, preparing them for the unit's next deployment. A third contract modification for $22 million was awarded for Abrams Tank Systems Technical Support (STS). Abrams STS facilitates engineering studies to identify improvements and provides for the change-out of obsolete parts, while keeping Abrams main battle tanks current to their base configurations. The STS program's objective is to maintain Abrams tanks at high operational readiness rates. This modification funds tank urban survivability kits, maintenance, field reset, and field service representative support for the Australian Land Forces' M1A1 Abrams program. Existing General Dynamics employees will perform the work in Sterling Heights. It is expected to be completed by December 2011. General Dynamics, headquartered in Falls Church, Va., employs approximately 81,000 people worldwide and had 2006 revenues of $24.1 billion. More information about the company is available online at www.generaldynamics.com. STERLING HEIGHTS, Mich. January 16, 2007 - The U.S. Army TACOM Lifecycle Management Command recently awarded a $12.6 million contract for M1A1 Abrams tank systems technical support (STS) to General Dynamics Land Systems, a business unit of General Dynamics (NYSE: GD). Existing General Dynamics Land Systems employees will perform the work in Sterling Heights, Mich. It is expected to be complete by Dec. 31, 2011. General Dynamics Land Systems designs, manufactures and supports land and amphibious combat systems for the U.S. Army, U.S. Marine Corps and allied nations. Headquartered in Falls Church, Va., General Dynamics employs approximately 81,100 people worldwide and expects 2006 revenue of approximately $24 billion. The company is a market leader in mission-critical information systems and technologies; land and expeditionary combat systems, armaments and munitions; shipbuilding and marine systems; and business aviation. More information on General Dynamics can be found online at www.generaldynamics.com. STERLING HEIGHTS, Mich. November 30, 2006 - The U.S. Army has awarded General Dynamics Land Systems, a business unit of General Dynamics (NYSE: GD), two contracts totaling $359 million for Abrams main battle tank work. The first contract, for $339 million for production of 350 M1A1 Abrams Integrated Management (AIM) tanks, includes an option for 50 additional tanks that would increase the value to $401 million if exercised. The second contract is for $20 million for production of loader's thermal weapon sights for M1A1 and M1A2 Abrams tanks. STERLING HEIGHTS, Mich. November 7, 2006 - General Dynamics Land Systems, a business unit of General Dynamics (NYSE: GD), has been awarded a $38 million U.S. Army contract to reset 89 M1A1 Abrams main battle tanks. The reset program is designed to reverse the effects of combat stress on military vehicles. Work will be performed in Anniston, Ala.; Sterling Heights, Mich.; Lima, Ohio; and Scranton, Pa., by existing General Dynamics employees, and is expected to be completed in late December 2007. Through the reset program, General Dynamics, in partnership with the Anniston Army Depot, will completely tear down, repair and apply select modifications to bring the tanks to a pre-combat condition and reissue them to Army units prior to their next deployments. The reset program is the first activity of a partnership formed in February between General Dynamics and the Anniston Army Depot to maintain core skills at both facilities, and provide continuous improvements and maintenance of both Abrams and Stryker fleets. STERLING HEIGHTS, Mich. August 29, 2006 - The U.S. Army has awarded General Dynamics Land Systems, a business unit of General Dynamics (NYSE: GD), $45 million to produce and install 505 Tank Urban Survivability Kits (TUSK) for Abrams main battle tanks supporting Operation Iraqi Freedom. Continued deployment and world operations have emphasized the priority to update existing tanks with increased capability. To this end, General Dynamics, in partnership with the Army's project manager, Heavy Brigade Combat Team, created the Abrams TUSK. An add-on kit for M1A1 and M1A2-series tanks to enhance crew survivability in urban environments, TUSK consists of a Loader's Armor Gun Shield (LAGS), a Tank Infantry Phone (TIP), Abrams Reactive Armor Tiles (ARAT), a Remote Thermal Sight (RTS) and a Power Distribution Box (PDB). Work will be performed in Tallahassee, Fla.; Westminster, Md. ; Lima, Ohio; Sterling Heights, Mich.; Eynon, Pa.; and Southwest Asia by existing General Dynamics employees and is expected to be complete by April 2009. General Dynamics, headquartered in Falls Church, Va., employs approximately 81,900 people worldwide and had 2005 revenue of $21.2 billion. The company is a market leader in mission-critical information systems and technologies; land and expeditionary combat systems, armaments and munitions; shipbuilding and marine systems; and business aviation. More information can be found online at www.generaldynamics.com. STERLING HEIGHTS, Mich. August 7, 2006 - The U.S. Army has awarded General Dynamics Land Systems, a business unit of General Dynamics (NYSE: GD), a $134.6 million contract to upgrade 60 M1A2 Abrams main battle tanks to the System Enhancement Package (SEP) configuration (M1A2 SEP), the latest, most technologically advanced Abrams tank. The contract includes a $145 million option to upgrade 60 additional M1A2 Abrams tanks. The M1A2 SEP is a fully digitized platform with a new command and control system, second-generation thermal sights and improved armor. This retrofit is part of an overall M1A2 tank upgrade program that integrates information technologies to improve soldier warfighting capability with enhanced command and control features like color maps and displays, networked communications, high-density computer memory and increased microprocessing speed. Work will be performed by existing General Dynamics employees in Lima, Ohio; Anniston, Ala.; Tallahassee, Fla.; Sterling Heights, Mich.; and Eynon, Pa. Delivery of the first 60 vehicles is slated to begin in November 2007. The 60 tanks associated with the option, if it is exercised, would be scheduled for delivery beginning in November 2008. STERLING HEIGHTS, Mich. April 5, 2006 - The U.S. Army TACOM Lifecycle Management Command has awarded General Dynamics Land Systems, a business unit of General Dynamics (NYSE: GD), a $22.3 million contract for M1A1 Abrams tank systems technical support (STS). STS funds engineering studies on Abrams tanks with the purpose of identifying improvements and conducting the change-out of obsolete parts, while keeping Abrams tanks current to their base configurations. The STS program's objective is to maintain Abrams tanks at high operational readiness rates. This contract enables the application of various kits to M1A1 tanks around the fleet. Additionally, it funds reset work. Through reset, General Dynamics employees service, repair and modify Abrams tanks returning from Iraq to a pre-combat condition and reissue them to Army units prior to their next deployments. Work will be performed by existing General Dynamics employees at various U.S.-based military installations and is expected to be complete by Dec. 31, 2006. General Dynamics, headquartered in Falls Church, Va., employs approximately 72,200 people worldwide and had 2005 revenue of $21.2 billion. The company is a market leader in mission-critical information systems and technologies; land and expeditionary combat systems, armaments and munitions; shipbuilding and marine systems; and business aviation. More information can be found online at www.generaldynamics.com. STERLING HEIGHTS, Mich. March 20, 2006 - The U.S. Army TACOM Life Cycle Management Command has awarded General Dynamics Land Systems, a business unit of General Dynamics (NYSE: GD), two contract modifications associated with the Abrams Integrated Management (AIM) tank program. The combined potential value of both contracts is $41.8 million if all options are exercised. The first modification, valued at $25.9 million, covers the labor associated with the production of 92 M1A1 AIM tanks for the U.S. Army between July 2006 and July 2007. The second contract modification, for $15.9 million, is for long-lead materials required to begin delivery in July 2007 of up to 100 additional M1A1 AIM tanks. AIM is a joint program to refurbish M1A1 Abrams main battle tanks. M1A1 Abrams tanks are completely disassembled and overhauled to a like-new, "zero-mile, zero-hour" condition. The refurbished M1A1 AIM tanks incur lower operational and support costs and report higher operational readiness rates. AIM is a joint program involving the U.S. Army Project Manager for the Heavy Brigade Combat Team; the TACOM Life Cycle Management Command; the Anniston Army Depot, Anniston, Ala.; and General Dynamics Land Systems. Work will be performed by existing General Dynamics employees in Tallahassee, Fla.; Sterling Heights, Mich.; Lima, Ohio; and Eynon and Scranton, Pa.
General Dynamics, headquartered in Falls Church, Va., employs approximately 72,200 people worldwide and had 2005 revenue of $21.2 billion. The company is a market leader in mission-critical information systems and technologies; land and expeditionary combat systems, armaments and munitions; shipbuilding and marine systems; and business aviation. More information about the company can be found at www.generaldynamics.com. ST. PETERSBURG, Fla. March 16, 2006 - The U.S. Army Field Support Command at Rock Island, Ill., has awarded General Dynamics Ordnance and Tactical Systems, a business unit of General Dynamics (NYSE: GD), a $49 million modification to an existing multi-year ammunition contract for the production of 120mm M831A1 and M865 Tank Training Ammunition. These rounds, fired from M1A1/A2 tanks, provide realistic training at a substantially reduced cost over using tactical rounds. This contract will be managed out of the General Dynamics Ordnance and Tactical Systems headquarters located in St. Petersburg, Fla. Work is expected to be completed by September 2008. General Dynamics Ordnance and Tactical Systems is a world leader in the manufacture of large- and medium-caliber direct and indirect-fire munitions, bomb bodies and Ball Powder® propellant. The company also manufactures precision metal components; provides explosive load, assemble and pack services for a variety of munitions, tactical missile and rocket programs; and designs and produces shaped charge warheads and control actuator systems. General Dynamics, headquartered in Falls Church, Virginia, employs approximately 72,200 people worldwide and had 2005 revenue of $21.2 billion. The company is a market leader in mission-critical information systems and technologies; land and expeditionary combat systems, armaments and munitions; shipbuilding and marine systems; and business aviation. More information about the company can be found at www.generaldynamics.com. LIMA, Ohio, February 16, 2006 - During a ceremony at the Joint Systems Manufacturing Center - Lima, General Dynamics Land Systems, a business unit of General Dynamics (NYSE: GD), today delivered the first five of 59 M1A1 Abrams Integrated Management (AIM) tanks to the Commonwealth of Australia. Awarded in November 2005, this foreign military sales contract is valued at $70 million. The M1A1 AIM tanks will replace the Australian Land Forces' aging Leopard main battle tanks. The Abrams M1A1 AIM tanks are survivable and affordable vehicles with excellent potential for network-centric warfare that will provide Australian Forces with increased connectivity, mobility and firepower. Additionally, the M1A1 AIM provides a cost-efficient armor solution as it incurs low operational and support costs, and reports high operational readiness rates. Under this contract, M1A1 Abrams tanks from the U.S. Army inventory are completely disassembled, overhauled and refurbished to like-new "zero-kilometer, zero-hour" condition. General Dynamics Land Systems Senior Vice President for Production, Delivery and Support Richard O. Gillette told ceremony attendees the process for the Australian tanks began last year when 59 M1A1 Abrams were inducted into General Dynamics Land Systems' partner facility, the Anniston Army Depot. "There, the vehicles were stripped of their component parts", Gillette said. "The process comes full circle here at Lima, where upgrades and technology enhancements are completed. Today's ceremony celebrates the first major deliveries under Australia's Foreign Military Sales program with the United States. This is a major achievement." Brigadier Damian Roche, the Australian Army Military Attaché to the United States, represented the Commonwealth of Australia. General Dynamics Land Systems and Australian vehicle crews participated in a symbolic vehicle log book presentation to signify the transfer of the tank from the contractor to the Australian government. Additionally, General Dynamics Land Systems, U.S. Army Foreign Military Sales program managers and Roche signed the first vehicle's official certificate of acceptance. The Australian M1A1 AIM tank has a cruising range of up to 480 kilometers, the ability to reach speeds of 66 kph on-road (41 mph) and up to 48 kph off-road (30 mph), while carrying four crewmen and ammunition. The primary weapon is a 120mm smooth-bore cannon; it is also equipped with a 50-caliber machine gun for the tank commander and two additional 7.62mm machine guns. The Abrams can fire an advanced kinetic energy tungsten penetrator round against vehicles and a multipurpose round for infantry support. The Abrams' survivability is enhanced through its nuclear, biological and chemical protection system, crew compartmentalization from munitions and armored blow-off panels, which allow stowed munitions to vent to the atmosphere if detonated. The 59 M1A1 AIM tanks will be shipped to Australian Land Forces in two increments: June and December 2006. The tanks are part of a large worldwide fleet with known, stable operating costs, and are expected to be in service beyond 2020. STERLING HEIGHTS, Mich. November 15, 2005 - General Dynamics Land Systems, a business unit of General Dynamics (NYSE: GD), was awarded the final $42 million delivery order of a $70 million foreign military sales contract from the U.S. Army Tank-Automotive and Armaments Command to provide 59 refurbished M1A1 Abrams Integrated Management (AIM) tanks to the Commonwealth of Australia. The M1A1 AIM tanks will replace the Australian Land Forces' aging Leopard main battle tanks. Survivable and affordable vehicles with excellent potential for network centric warfare, the Abrams M1A1 AIM tanks will provide Australian Forces with increased connectivity, mobility, firepower and survivability. Additionally, the M1A1 AIM provides a cost-efficient armor solution as it incurs low operational and support costs, and reports high operational readiness rates. Under this contract, M1A1 Abrams tanks from the U.S. Army inventory will be completely disassembled, overhauled and refurbished to like-new "zero-mileage" condition. The tank has a cruising range of up to 480 kilometers, the ability to reach speeds of 66 kph on-road and up to 48 kph off-road (while carrying four crewman and ammunition). The primary weapon is a 120mm smooth-bore cannon; it is also equipped with a 50-caliber machine gun for the tank commander and two additional 7.62mm machine guns. The Abrams can fire an advanced kinetic energy tungsten penetrator round against vehicles and a multipurpose round for infantry support. Work will be performed by existing General Dynamics and Department of Defense employees in Anniston, Ala.; Lima, Ohio; Scranton, Pa.; and Tallahassee, Fl. The 59 M1A1 AIM tanks are scheduled for delivery to Australian Land Forces in two shipments, in June and December 2006. The tanks are part of a large worldwide fleet with known, stable operating costs, and are expected to be in service beyond 2020. General Dynamics will offer the Commonwealth of Australia the same comprehensive material and logistics support available to the Abrams fleet worldwide. General Dynamics Land Systems-Australia, a subsidiary, will take the lead in working with the Commonwealth to structure and implement a robust logistics system for the vehicles. General Dynamics, headquartered in Falls Church, Va., employs approximately 71,900 people worldwide and had 2004 revenue of $19.2 billion. The company is a market leader in mission-critical information systems and technologies; land and expeditionary combat systems, armaments and munitions; shipbuilding and marine systems; and business aviation. More information about the company can be found at www.generaldynamics.com. STERLING HEIGHTS, Mich. Nov. 1, 2005 - The U.S. Army TACOM Lifecycle Management Command has awarded General Dynamics Land Systems, a business unit of General Dynamics (NYSE: GD), a $13 million contract for spare parts for the M1A2 Abrams tank continuous electronics evolution program. The M1A2 Systems Enhancement Package platform is the latest, most technologically advanced Abrams tank. It has the latest command and control system, second-generation thermal sights and improved armor. This contract aligns with the overall M1A2 SEP tank upgrade program to integrate new information technologies to improve soldier warfighting capability with enhanced command and control features like color maps and displays, high-density computer memory, increased microprocessing speed and networked communications. Work is slated to begin immediately and will be performed in Sterling Heights, Tallahassee, Fla., and Eynon, Pa., by existing General Dynamics employees. Work is expected to be completed by July 31, 2007. General Dynamics, headquartered in Falls Church, Va., employs approximately 71,900 people worldwide and had 2004 revenue of $19.2 billion. The company is a market leader in mission-critical information systems and technologies; land and expeditionary combat systems, armaments and munitions; shipbuilding and marine systems; and business aviation. More information about the company can be found at www.generaldynamics.com. With award of the $15.6 million increment on July 28, the Army increased the total tank material sets purchased under the contract to 92 sets, 17 more than the original estimate of 75. AIM is a joint effort to refurbish M1A1 Abrams main battle tanks involving the U.S. Army Project Manager for Combat Systems; the TACOM Life Cycle Management Command; the Anniston Army Depot, Anniston, Ala.; and General Dynamics Land Systems. Under the AIM program, M1A1 Abrams tanks are completely disassembled and overhauled to a like-new condition. Refurbished AIM tanks incur lower operational and support costs and report higher operational readiness rates. Work will be performed in Lima, Ohio, and Eynon, Pa., by existing General Dynamics employees. The AIM tanks are scheduled for delivery to U.S. Army units between July 2006 and July 2007. General Dynamics, headquartered in Falls Church, Virginia, employs approximately 70,800 people worldwide and had 2004 revenue of $19.2 billion. The company is a market leader in mission-critical information systems and technologies; land and expeditionary combat systems, armaments and munitions; shipbuilding and marine systems; and business aviation. More information about the company can be found at www.generaldynamics.com. STS funds engineering studies and investigations on Abrams tanks with the purpose of identifying improvements and change-out of obsolete parts, while keeping Abrams tanks current to their base configuration. The STS program's objective is to maintain Abrams tanks at high operational readiness rates. Work will be performed at General Dynamics Land Systems headquarters here and is expected to be complete by July 31, 2006. The contract was initially awarded Nov. 23, 2001. General Dynamics, headquartered in Falls Church, Va., employs approximately 70,100 people worldwide and had 2004 revenue of $19.2 billion. The company is a market leader in mission-critical information systems and technologies; land and expeditionary combat systems, armaments and munitions; shipbuilding and marine systems; and business aviation. More information about the company can be found at www.generaldynamics.com. STERLING HEIGHTS, Mich. June 21, 2005 - The U.S. Army TACOM Lifecycle Management Command has awarded General Dynamics Land Systems, a business unit of General Dynamics (NYSE: GD), a $14.4 million contract modification for Abrams tank systems technical support (STS). Work will be performed at General Dynamics Land Systems headquarters here and is expected to be completed by July 31, 2006. The contract was initially awarded Nov. 23, 2001. STERLING HEIGHTS, Mich. June 20, 2005 - The U.S. Army TACOM Lifecycle Management Command has awarded General Dynamics Land Systems, a business unit of General Dynamics (NYSE: GD), a $141 million contract to upgrade 60 M1A2 Abrams tanks to the latest System Enhancement Package (SEP) configuration (M1A2 SEP). The M1A2 SEP fully digitized platform is the latest, most technologically advanced Abrams tank. It has the latest command and control system, second-generation thermal sights and improved armor. This retrofit is part of an overall M1A2 tank upgrade program that integrates new information technologies to improve soldier warfighting capability with enhanced command and control features like color maps and displays, high-density computer memory, increased microprocessing speed and networked communications. These 60 M1A2 tanks have been in service for the past 15 years. Work is slated to begin in July 2005 and will be performed in Lima, Ohio; Anniston, Ala.; Sterling Heights, Mich.; Tallahassee, Fla.; Scranton, Pa.; and Fort Hood, Texas, by existing General Dynamics employees. Vehicle deliveries to General Dynamics are scheduled for January through October 2007, with vehicle hand-off to the U.S. Army expected in January 2008. STERLING HEIGHTS, Mich. - February 10, 2005 - The U.S. Army Tank-Automotive and Armaments Command has awarded General Dynamics Land Systems, a business unit of General Dynamics (NYSE: GD), a $35.2 million contract for the labor associated with the production of 120 Abrams Integrated Management (AIM) tanks. AIM is a joint effort to refurbish M1A1 Abrams main battle tanks involving the U.S. Army Project Manager for Combat Systems; the Tank-Automotive and Armaments Command; the Anniston Army Depot, Anniston, Ala.; and General Dynamics Land Systems. Under the AIM program, M1A1 Abrams tanks are completely disassembled and overhauled to a like-new condition. Refurbished AIM tanks incur lower operational and support costs and report higher operational readiness rates. Work will be performed in Lima, Ohio, Eynon, Pa., and Muskegon, Mich., by existing General Dynamics employees. The 120 AIM tanks are scheduled for delivery to U.S. Army units at Fort Riley, Kan., and other installations beginning in August 2005. General Dynamics, headquartered in Falls Church, Va., employs approximately 70,200 people worldwide and had 2004 revenue of $19.2 billion. The company is a market leader in mission-critical information systems and technologies; land and expeditionary combat systems, armaments and munitions; shipbuilding and marine systems; and business aviation. More information about the company is available on the Internet at www.generaldynamics.com. STERLING HEIGHTS, Mich. - January 28, 2005 - The U.S. Army Tank-Automotive and Armaments Command has awarded General Dynamics Land Systems, a business unit of General Dynamics (NYSE: GD), a $161 million modification as part of a $283 million contract to retrofit 129 M1A2 Abrams tanks with an enhanced electronics package. The retrofitted tanks will modernize the U.S. Army's 3rd Armored Cavalry Regiment, Fort Carson, Colo. In May 2004 the U.S. Army awarded General Dynamics a $121 million contract to retrofit 65 of the unit's M1A2 tanks. This modification rounds out the contract to modernize the unit's entire 129-tank fleet. Work will be performed in Lima, Ohio, Tallahassee, Fla., Scranton, Pa., Muskegon, Mich., and Anniston, Ala., by existing General Dynamics employees. STERLING HEIGHTS, Mich. - January 25, 2005 - The United States Army Tank-Automotive and Armaments Command has awarded General Dynamics Land Systems, a business unit of General Dynamics (NYSE: GD), a $24 million contract for systems technical support (STS) for the Abrams tank. STS allows the change-out of obsolete parts and keeps the Abrams tanks current to their base configuration. The main objective of STS is to keep the tanks running at high operational readiness rates. Work under this contract will be performed at General Dynamics Land Systems' headquarters in Sterling Heights, Michigan, and is expected to be completed by September 30, 2006. General Dynamics, headquartered in Falls Church, Virginia, employs approximately 71,600 people worldwide and anticipates 2004 revenue in excess of $19 billion. The company is a market leader in mission-critical information systems and technologies; land and expeditionary combat systems, armaments and munitions; shipbuilding and marine systems; and business aviation. More information about the company can be found at www.generaldynamics.com. The ARMOR Site! is © Copyright 1997-2007 Fabio Prado . All Rights Reserved.